There’s no need to shout. Standing next to someone with a poster and a megaphone doesn’t get the message across to anyone anymore. Consumers have become desensitized to the noise that traditional outbound marketing creates. It’s easier to shut it out—or shut down around it—than it is to pay attention to it. This makes loud, colorful, indiscriminate advertising less than effective for any company trying to grow its customer base. On the other hand, 75 percent of marketers prioritize inbound marketing. 52 percent of inbound marketers say that paid advertising is the most overrated marketing tactic. 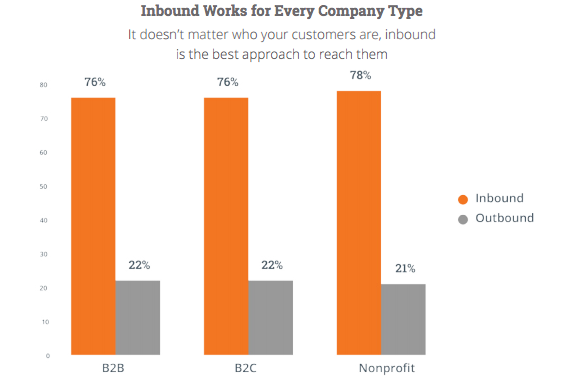 And inbound strategies work for all companies, including nonprofit organizations, B2C enterprises, and B2B tech companies. The best option for all companies, including B2B tech companies, is to shift to inbound marketing plans. Instead of being pushy or aggressively seeking out customers, inbound marketing aims to lure customers to their business. The idea of inbound marketing was first described by HubSpot in 2006. The basic plan for any inbound strategy is to attract visitors, which generates leads and then customer sales. The final step is for the company to continue to delight its customers so that they promote the company, bringing more potential clients to its doors through word-of-mouth. In an inbound marketing strategy, an understanding buyer persona is imperative. A B2B tech company that understands where a possible client company is coming from, including the industry culture and what questions really need to be answered, has a shot at building a relationship that could turn industry associates into clients. B2B marketing all comes back to the human side of things, and it’s all dependent on context. Because every company is different, they’ll have different goals, different messages, and different methods. 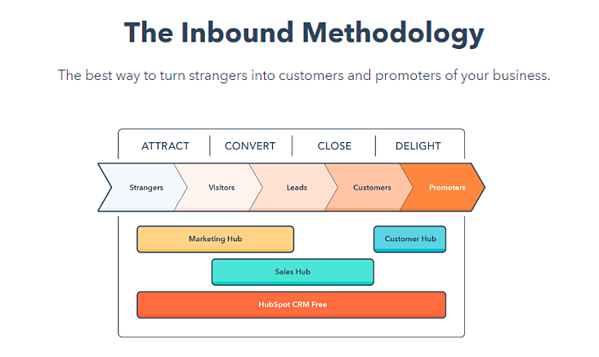 Adapting a marketing message to target a very specific customer base and then drawing those customers into a sales funnel is what inbound marketing is all about. In its simplest sense, inbound marketing is the development of digital charisma for the B2B tech company. It’s the opposite of the ‘nice guys finish last’ scenario, and it’s effective. 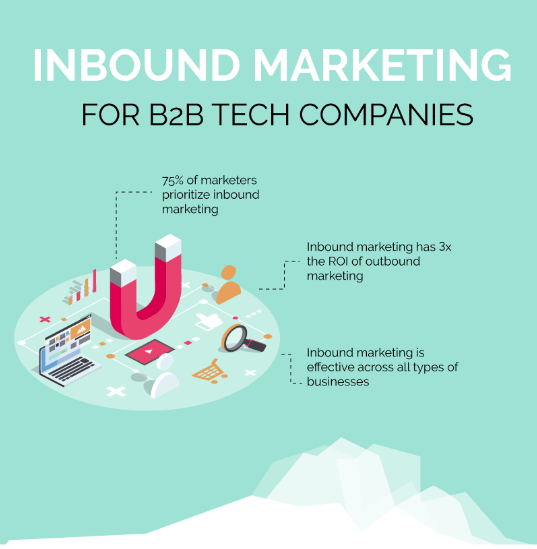 Inbound marketing is effective for B2B tech companies partly because it helps ease the discomfort of sales for clients. Basic marketing rests both on meeting a need and on meeting that need in a way that causes the least discomfort to the potential customer. Keeping costs low, providing pleasant interactions and making purchasing decisions easy for clients are vital to keeping customers happy, which means keeping them around long enough to make a sale. Inbound marketing works this way in part because it shows professional courtesy between B2B companies and their potential clients. By directing clear messages to clients, without pressure, B2B companies build trust. Done right, a good inbound marketing strategy has the power to cut through the noise of traditional advertising with clear, consistent, thoughtful messages. Because these messages are directed only at their target audience, B2B tech companies can save resources that would be wasted by trying to advertise to everyone. The targeted audience means that B2B companies can scale their efforts, including automating posts across a wide variety of social media platforms, to help bring traffic to the company website while conserving resources. They’re effective because the leads generated through inbound marketing methods are quality leads. The people who pose questions about the products and services are people who have reasons to be there, and they want to learn more. Although marketing efforts seem quieter overall, B2B tech companies haven’t forgotten about their brands or advertising. They’re just going about it in a more direct way, offering advice and helpful information while making sure their products are readily available and attractive. In a B2B inbound marketing plan, ads are strategically placed and center more on the great content these companies offer than on the products themselves. Content is usually published in the form of blog posts and associated social media updates. Often, it’s something entertaining or informative in a way that relates, even if it’s just loosely, to the products or services the B2B tech company wants to sell. SEO, meaningful calls to action and using analytics to adjust the strategy through time also have their places in inbound marketing plans. These days, used car dealers and door-to-door vacuum cleaner salesman are something to build jokes around. There was a time, though, when heavy-pressure tactics were more common than not. These outbound marketing tactics were aggressive and intrusive, driving people and corralling them into purchasing decisions they weren’t ready to make. Inbound marketing plans depend almost completely on context. Because campaigns are tailored to specifically targeted audiences, everything from the vocabulary to the length of the sentences used is considered. The tone is adapted to the industry the target audience works in. Not only are the messages adjusted for specific target audiences by industry, but they’re also tweaked for delivery across different social platforms, as well. For example, a social media post regarding a piece of content a B2B company produces will be more formal on professional sites like LinkedIn, more casually social on sites like Facebook, and straight to the point on sites like Twitter and Instagram. While the basic message is the same, it sounds different depending on how, when, and to whom it’s delivered. Outbound marketing messages are much more indiscriminate. Because outbound methods broadcast the message to everyone, it seems as though little thought goes into determining a target audience. Advertisements can be too frequent and too loud. Overall, it’s a much more in-your-face scenario, because there isn’t a good context to wrap the message in. Here, at least, the main goal is the same: both inbound and outbound marketing aim to find clients, make sales and grow the company. There are a few differences in the goals, though. Outbound marketing goals don’t rely as heavily on getting to the sales funnel pleasantly. It’s more just about getting the job done. Inbound marketing goals focus on getting the job done right, meaning they make client experiences pleasant enough that clients become repeat customers, who will also promote the B2B tech company as a great industry partner to work with. The intended message of an inbound marketing message, ultimately, is mutual respect. When a B2B tech company uses thoughtful messages directed at particular potential clients, the result comes across as an invitation rather than as an advertisement. As a side, the carefully curated content and original posts offer helpful information or entertainment that add value to the relationship even before a potential client truly becomes a lead. Outbound marketing focuses mostly on sales, and how the company can get them. While some attention is paid to keeping costs down, being pleasant and making things easy for the customer, the main message is that the customer can’t and shouldn’t try to live without the product and service mentioned in the advertising campaign. Outbound messages rely on videos, audio recordings, signs, newspaper, and magazine ads—anything designed to get the attention of a potential client and get them thinking about the products and services they want. There’s a constant barrage of advertisements on radio, television, print and on computer screens. While inbound marketing does create messages, they’re more subtle, more alluring, and more thought-provoking. Traditional messages, while delivered through the same means as outbound messages, are more about reaching out to help the community than to obtain quick sales. Online messages are delivered through blog articles and social media posts that are strategically placed where potential clients can come across them on their own. Instead of blaring, inbound messages are intriguing, and they try to anticipate and answer questions that the potential clients might have. Inbound marketing has three times the return on investment that outbound marketing does. It’s also effective across all types of businesses (B2B, B2C, and nonprofits). There are three steps to getting a sale: awareness, consideration, and decision-making. In the awareness stage, a potential client might just be becoming aware of a problem or issue and could be uncertain about whether or not finding a solution is necessary. During the consideration phase, the client is looking around to see how similar companies handle the issue and might be investigating possible courses of action. The decision-making stage is where the client decides to create and proceed with an action plan or let things lie where they are. These stages of the buyer’s journey are addressed in completely different ways in outbound and inbound marketing. For example, in the awareness phase, an outbound marketer could be giving a potential client ideas and solutions that the buyer isn’t yet ready for. In inbound marketing, the B2B tech company will proactively send out bits of information that a potential client can easily stumble across. The information will aim at answering questions and helping the clients determine whether there really is an issue that needs addressing or not. Before a B2B tech company can launch a successful marketing campaign, the strategy has to be determined. The strategy is like the blueprints for a house. It lets you know what pieces need to go in which places to build something strong, durable, and useful. A successful marketing strategy depends on getting to know the buyer persona and creating good content aimed at the buyer persona. Utilizing SEO and meaningful calls to action can help. So can using analytics to determine whether adjustments need to be made in the marketing approach, and understanding the buyer’s journey can allow B2B tech companies to guide potential clients through the sales funnel. Because inbound marketing strategies are specifically targeted to potential buyers, getting to know those buyers is one of the most important things a B2B marketing company can do. That makes detailing the buyer persona to develop marketing campaigns around the first step for building a successful inbound marketing strategy. The buyer persona is more important than it sounds like at first. It affects the tone you write your messages in. More importantly, they’re the main source for specifically targeting your audience. To understand a buyer persona, some businesses create a psychological image of the ideal client. They name the imaginary clients and give them a few specifics that will allow them to imagine the client’s perspectives—and what drives their purchasing choices. The buyer persona a B2B tech company should focus on is a business leader and not someone low on the totem pole. This is because executives are the key decision makers for a business. Anyone working under them will still have to get their approval for major purchases. What is their rank in the company? What kinds of decisions are they used to making? Does this person have any say over the type of technology this company uses? Does this person have the authority to say yes or no to a business deal? What challenges does this person have? How does this person see the world? Once you have an idea of the kind of person you’ll be dealing with, you can think ahead and brainstorm some ways to connect with them. You’ll also need to think about what their buying triggers are. Buying triggers are the events or unidentified needs that help your target understand that there’s a problem and that your company might just be suited to find a solution for it. Triggers often lead to the development of goals, too. If you can learn what those goals are, you’ll have a pretty well-rounded idea of your buyer’s persona and how to target your marketing messages to them. The sub-structures of good inbound marketing strategies are the marketing campaigns you run inside it. Inbound marketing relies on good content to draw buyers, so the next step is to plan the articles and blog posts you’ll need to write. The best blog post ideas come when you consider the goals of a buyer’s persona and what questions he or she might have. Use those two pieces of thought to generate a blog topic and title. Then plan your editorial calendar around your blog posts, and write when your creative juices flow. Each blog post will be the main thrust of a separate marketing campaign, and each campaign could last two or three months. Plan accordingly with possible social media messages to accompany and link back to the main post. It’s also not too early to start researching keywords for search engine optimization or to brainstorm calls-to-action. The SEO bumps page ranks higher so that potential buyers can see your content and what your company has to offer. The calls-to-action help converts visitors to leads that you can contact directly later. Find a way to make your company stand out—be unique and passionate, aware of whom you’re talking to, dramatic and consistent. Be a subjective human being. The buyer’s journey was introduced briefly in Chapter Two. It’s an important piece of the inbound marketing puzzle because every part of the campaign has to align with coordinating spots on the buyer’s journey. For example, white papers and e-books that can help clients determine they have a problem to solve are associated with the awareness phase, the first step on the buyer’s journey. Gated content like forms and sign-ins for webinars are part of the consideration phase, where clients get more useful information from your company. In the decision-making stage, the client has decided on a solution and is now sifting through vendors who can provide it. Messages now can include information about the products and services that your B2B tech company can provide. This is also when a site visitor becomes a lead that can be passed on to the sales team. The next chapter will address how to align various facets of an inbound marketing strategy, such as blogging and SEO, with the buyer’s journey. Viaccess-Orca (VO) is a B2B tech company that provides content protection solutions for pay television options. Its Eye on Piracy program is designed to prevent hackers from getting into the system, and streaming content to their own devices particularly sports events. The company’s services have a long 1 to 2-year sales cycle, which made outbound marketing difficult even though the target audience was already identified. Most of the advertising messages in the past focused on antipiracy themes. Efrat Fenigson, Senior Director of Marketing Communications at VO, created an inbound marketing plan that changed everything. Instead of focusing on antipiracy, the company created content that centered on sports—and the bad things that happen when people pirate sports content. VO zeroed in on sports events. New content featured sports events and the real damages caused by pirating. The content included a successful e-book, white paper, blog posts, and emails, with the intent to educate people about the dangers of illegal rebroadcasting of sports events. This campaign bumped interaction and engagement up, but the real success came from a webinar based on the same topic as the white paper and then the follow-up World Cup Campaign. The webinar was scheduled just before the World Cup in Brazil, which was ideal timing because this soccer event is often illegally rebroadcast over the world. Participants were also invited to join the subsequent World Cup campaign. This campaign requested contact information from interested parties in return for informative weekly newsletters and updates on what was happening with piracy during the World Cup. The webinar generated more than 190 leads and created a huge sales funnel containing people who were interested and engaged. Quotes from the weekly newsletters were later quoted in online articles, and this drew the attention of Ernesto Sar, founder, and CEO of TorrentFreak. Sar got permission to use those quotes again. He wrote an article that appeared in Newsweek, The International Business Times, and The Guardian. The positive press led to a panel organized by VO that featured a senior broadcast rights manager from the International Olympics Committee. For the company itself, the real win was the generation of close to 1000 leads as a result of their inbound marketing strategy. Watch what is going on around you and fit your message to those events— as Fenigson did with the World Cup. Being aware of opportunities as they come up and timing your campaigns around them can create positive synergy. In the beginning, talk about related content but not about your products and services. VO’s switch in focus from simple antipiracy statements to sports-centered messages sparked conversations that led to company growth and the content protection of other companies who became VO’s clients. The power of the media can make or break you. Aim for positive press, and use it to further excitement and generate more engagement. Build partnerships that allow all parties to grow. The webinar prior to the World Cup is a great example. VO partnered with a third party for that event, and the payoff was immense. As more technology is developed, marketplace competition increases. Finding new ways to reach customers in ways that empower them to make solid purchasing decisions can impact how fast a B2B tech company can grow. Be interesting, be informative—inbound marketing plans are content-driven, and that content centers on new or relevant information in target audiences. The more information you freely share, the more potential clients will trust your brand and remember you when they’re looking for solutions to their problems. Understand your buyers—Really understanding where buyers are coming from allows you to see the problems they face from their perspectives. When this happens, you know the kinds of challenges they face and the questions they have. You can provide helpful content, answer questions and build relationships. Understand differences between inbound & outbound marketing plans—there are times when techniques from both systems will overlap. If you know what’s going on, you can plan campaigns to combine the best methods from both camps or temper your outbound efforts to let your inbound strategy shine. Invite, don’t intrude—inbound marketing plans are short and friendly. In an inbound marketing situation, companies make their products and services both as alluring and as visible as they can. The result is an invitation for potential clients to learn more rather than an intrusive demand on a buyer’s time. Do your research—using keywords for SEO and hashtags to lift page rank is important, but it only works when it’s done right. Use the best keywords and hashtags, use the right amount, and use them at the right times and on the right platforms. Avoid gimmicks like keyword stuffing—you don’t want your high-quality content to be labeled as spam. Watch the Stats—and adjust your campaigns accordingly. Knowing where you stand, especially compared to where you’ve been, can help keep you moving forward in the right direction. Keep it Simple—if you overwhelm a potential client, you won’t get a lead or a sale. Offer information in the right amounts, so they have time to absorb it. Pay attention to the buyer’s journey—and to sales funnels. Make sure the content you deliver is geared toward where the potential client is in the lead generation process. As your B2B tech company grows, adjust your inbound marketing strategy to fit the needs of the industry around it. This will keep your business in the center of the growth, where you’re able not only to complete business goals, but to help other companies achieve their designs, as well. For more information, download this resource HERE. The buyer’s journey and the sales funnel go hand in hand. At each stage of the process, different ways of communicating the campaign message can be used to invite clients further down the sales funnel. The first step in the sales funnel is the attraction phase, which corresponds to the awareness phase of the buyer’s journey. At the top of the funnel, it’s all about good content—articles and social media that potential clients can find. Blogging is one of the core tenets of inbound marketing because it drives traffic to your website. If a potential client searches for something you’ve already blogged about, even months or years ago, that post might pop up to answer questions and lead him or her to your company. Every month, 70 percent of traffic comes from blogs that were published before that month. Blogs provide leads for 43 percent of marketers, as well. A B2B tech company should be blogging at least one to two times per week. Clients that blog 16 or more times each month generate 4.5 times more leads than clients who blog 0-4 times per month. A call-to-action should be included on every post to gather names for direct marketing later on. In order for your blog to be seen, search engine optimization is a must. Use long-tail keywords with regular keywords to bring the right kind of traffic, but there has to be a balance between optimization and writing. If you use too many keywords, the document will look like spam. Keywords should go in the title, body, URL and Meta descriptions. This helps our site rise to the top of search engine results and helps convert traffic into leads. It’s important because 74 percent of users never scroll beyond the first page of search results. Traffic can also be converted to leads using a call-to-action. A call to action is something that the website visitor can click on to obtain valuable content such as white papers, e-books and access to webinars. A call to action should show a reader what the benefits are for them to learn more about your message. How will it help them or their business? How can they use the information you give them? Showing them the benefits properly builds trust for you with them so that they’ll want to continue to build the relationship. Use appropriate colors, size, and placement to make sure the call to action fits with your industry. If you can customize it, that’s even better. Customized calls to action convert 42 percent better than generic ones. Content strategy starts with blogging, but you can spin off a variety of social media messages around one blog post. This will make up the bulk of an inbound marketing campaign, with the rest coming mostly through comments and conversations that start up around this topic. Your strategy is to get the conversation going in a way that makes your business shine and helps other companies, as well. You can use several campaigns at once to further your content strategy. For example, if you want to sell data analytics packages to another company, you might use one campaign that addresses happy corporate cultures (who don’t have to worry about analyzing their own data) and one campaign that focuses on increased profits (because data analyzation can ultimately help bring in more sales). Write articles that address the goals of your buyer’s persona and answer the questions they could have. Your content strategy should include a mix of social media messages from all your available social media platforms. Use this mix to create a demand for your products and services by showing them there’s a problem to be solved—and that you can help. A good social media strategy is a big part of inbound marketing. Make sure you have a full inventory of social media marketing messages that you can send out at intervals to accompany and link back to the blog post. This allows you to automate your messages, which will save you resources. Also, remember there’s a hashtag for everything. Use the right ones, and don’t use too many. Do your research to discover the best ones the same way that you do for SEO keywords. Most importantly, engage in conversations about your campaign on as many different social networks as possible. Of course, if most of your target audience hangs out on one platform—Reddit or LinkedIn, for example—that’s where you’ll want to spend the bulk of your time. Make sure the tone of your comments matches the tone that people from your target industry use. If you can mirror the way they speak, you’ll automatically build trust. Once a potential client clicks through to a B2B tech company’s website, the next step is lead generation. This means finding a way to get that person’s contact information so that marketing efforts can be continued, targeted and directed. Lead generation traditionally happens through gated content, like signing up on a landing page, filling out a form, or sending a request through a contact page to access webinars or e-books. By this time, the potential client will be aware of something that needs to be changed and will be actively seeking a solution. At this point, it’s important to understand the difference between lead generation and demand generation. Demand generation is all about creating awareness about a B2B company’s products and services, including why another company might need to use them. Lead generation focuses on getting prospective clients to your content by voluntarily giving you their contact information. The content they access will then lead them closer to discovering your products and services. In essence, demand and lead generation is a mix of inbound and outbound marketing strategies. The best marketing plans use both, although not at different times, and it’s always best if the approach can be tailored to the individual. For example, someone who comes across demand content first hears about your company’s products and services, but isn’t sold on the idea of signing up on a landing page to receive more of your company’s content. While they might stick around and convert to leads and sales later, there’s no guarantee. This is important to note because inbound marketing is all about lead generation, or simply getting people to your content, where you can nurture relationships that will bring the highest quality leads with the best chances of successful conversions. For that, you need high-quality content on an interesting, thought-provoking landing page that provides further value to the potential client. If they’re going to give away their contact information voluntarily, they should be getting something meaningful in return. Near the closing phase, e-mail marketing can become an important part of moving someone down the sales funnel. It can’t be done with generic templates, though. Every lead conversion is still an individual conversion. It needs to be treated that way if you’re going to be successful in building long-term business relationships with your potential clients. Proactive processing is a way to use e-mail marketing to both generate further leads and move leads that have come through gated content further along. The first step is to pick three or four specific areas you want to target. You can’t target them all, and it’s important to have a place to start that will narrow down the scope of your content. You can direct that as a short (150-200 words) e-mail message both to content-generated leads and to target people you find on your own. 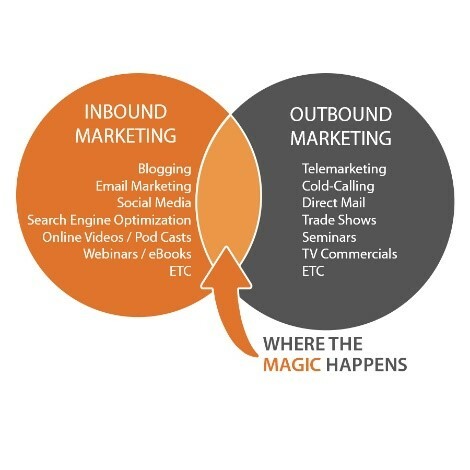 This is where the mix of outbound and inbound marketing comes in. With proactive processing, you need to be constantly looking and creating lists of potential clients to follow up with even if they don’t come through your gated content. One of the best ways to do this is to pay attention to companies that might not be ready for your products and services yet, but might be someday. Watch them, and when something changes, use it as a reason to reach out personally and offer something of value to them. An article from a third party that begins to address their needs might be a good place to start. This approach works well both for generating new leads as well as for opening discussions about your company’s products and services for leads generated with gated content. In both instances, it’s about moving from content to products and services, where high-quality leads are converted to sales. Every company wants to retain their customers, and B2B tech companies are no exception. Providing authentic, relevant experiences for clients is one way to win long-term loyalty. Web Personalization is the idea of talking to clients about specific products and services based on their characteristics and interests rather than on general information. It’s simply holding a friendly conversation with someone about particular things they enjoy or need; only it’s done online rather than in person. Once again, understanding buyer persona comes to the forefront. Messages on the website can be thoughtfully targeted to the buyer persona. Content can also be directed at the customer’s industry or organization styles. Further personalization happens when options are presented, such as mobile vs. desktop apps or language preferences. Automation tools can help, too. HubSpot has a ‘Smart Content’ feature that delivers content tailored to where a client is in the sales funnel. Marketo, SalesForce, and Oracle Marketing Cloud/Eloqua also have personalization tools to help provide tailored content at the right time. 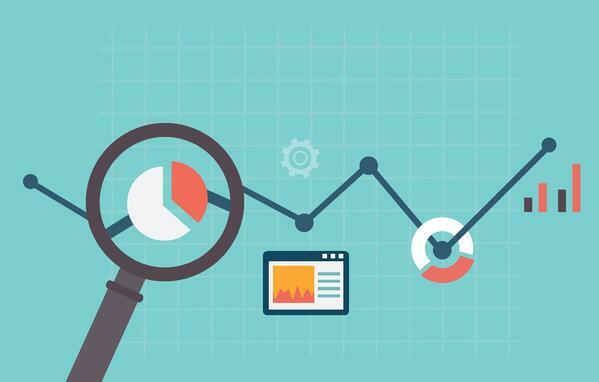 The last step of building a solid inbound marketing campaign is to tweak it using analytics. Constant feedback and explicit goals with milestones can help a B2B tech company move forward with all its campaigns. In order to prove a return on any marketing campaign, results must be measured. Keeping an eye on the analytics can help a B2B tech company stay on top of changing trends and tweak campaigns as they go along. It’s like following a recipe, but knowing what data to track and analyze can be difficult. Not all metrics are equally important. Some need to be tracked daily, some weekly, and some monthly. These five metrics can be checked and discussed monthly to allow constant calibration of marketing efforts. Social media exposure—this includes the number of clicks per message compared to previous months. If your total of clicks goes down, make some adjustments. Likewise, if click volume goes up, investigate why, replicate the reason and shoot for even higher click numbers. Blog post views—looking at the content of the most-viewed blog posts and comparing them with lower performing posts can give a B2B tech company information about what kinds of blog posts resonate with readers. The simplest adjustment is to simply do more of what is already working. If you have a lot of variables to work with, A/B test them moving forward to determine what works best. Website traffic sources—an automation platform or unique tracking codes can give information about who comes to your website and how visitors find you. This helps B2B companies understand which marketing campaigns have the highest return on investment. E-mail click-through rates—this is where you measure which campaigns are doing best by watching the number of clicks coming from e-mails. Look at what the e-mail intended to promote as well as the tone and style. If you can discover what’s working, you can duplicate it in campaigns that aren’t performing quite as well. Leads and prospects gained—the conversion rates of landing pages can show you the number of leads your gated content has generated. Look deeper at what you promoted on the landing pages that generated the most leads. Once again, if you can analyze what you did right, you can duplicate it on other landing pages. When it comes time to report to a boss, choose what you share carefully. They need enough information to make good decisions for the future. By the same token, you don’t want to provide so many facts and figures that the takeaways get lost in a sea of numbers. Leads and prospects gained—because these have a direct impact on sales and company growth, definitely share how many leads your landing pages generated. Looking at all the different sources, share the content topics that are performing the best and worst. Also share the types of content that are performing the highest, so executives can determine where to increase or decrease budgets.